The coyote is not a native species of Virginia, and was first observed in the very western regions of the Commonwealth in the early 1950s. Coyotes are about the size and weight of a medium-sized dog. They generally have longer and thicker hair or fur than a dog. Their long black tipped tail is usually bushy and is pointed downward rather than outward or upward. The fur of the coyote in Virginia can vary from blond, light reddish-brown or tan, grayish black, or black with a small white blaze in the center of the chest. The coyote ears are pointed and erect, and the snout is relatively long and slender. The coyote in the eastern United States is typically larger than coyotes in the western United States. Female coyotes weigh on average 30 – 40 pounds, and male coyotes weigh on average 35 – 45 pounds. Coyotes can weigh as much as 60 pounds. The coyote is distributed throughout the Commonwealth and prefers semi-forested or open farm and pasture lands. Coyote populations in more forested landscapes are generally less abundant and typically exhibit different foraging and social behaviors depending on forest prey species size and abundance. 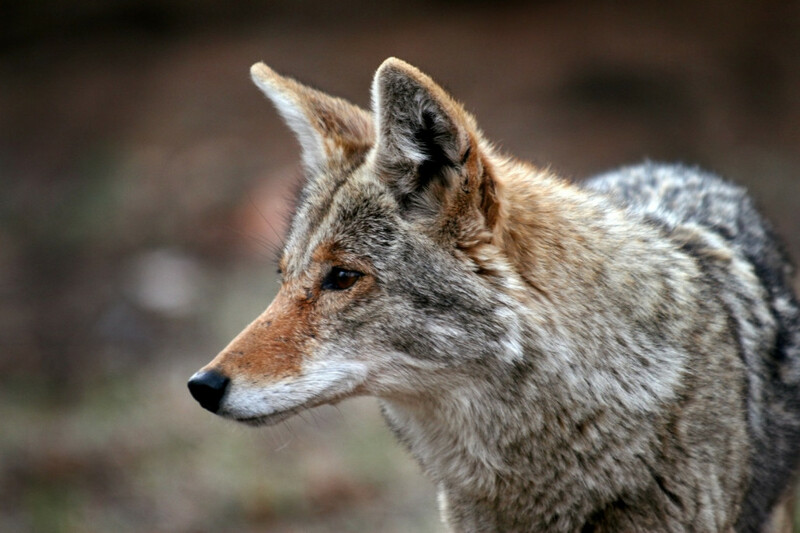 Surveys of hunter harvest of coyotes as well as surveys of hunter observations of coyotes while hunting big game indicate that the coyote population is more abundant in counties west of the Blue Ridge Mountains. Coyotes are elusive and normally avoid humans. They can be active at anytime of day or night, but are more typically observed at dawn and dusk. The coyote communicates by barking, yelping, and howling. Male and female coyotes form a pair bond and establish and defend a territory were they raise 3-12 pups that are born anytime between late March and May. The pups are fed by both the male and female, and sometimes by one or two offspring from a previous litter. The pups may disperse and leave the parents territory anytime after August. However, the parents may tolerate the pups occupying their territory as late February if prey resources are plentiful and large in size (e.g. deer). They remain active and do not hibernate in dens regardless of winter severity. Coyotes will develop a “search image” for a prey type that is more easily scavenged or killed. A coyote’s “search image” includes visual, auditory, and olfactory senses. When the abundance of a specific prey decreases to the point that a coyote is opportunistically finding and consuming more of a different prey resource than it is actually hunting for, the search image of the coyote will change to reflect the more abundant or most easily accessible food resource available in it’s home range. The habitat and space that the coyote hunts in may also change depending on the type of habitat that the predator is more likely to fill its belly. In situations where wild game is stocked to reestablish populations for hunting, or situations where livestock are raised and maintained throughout the year, coyotes may artificially retain a search image for the artificially abundant game or livestock that also tend to be more vulnerable to predation. The coyote is an opportunistic forager that will consume anything of nutritional value. They do not specialize in hunting and killing only one type of prey, and they will not turn down an easy meal if they happen to stumble onto other prey that they were not hunting for. Consequently, coyotes will prey and scavenge on anything including vegetable matter and fruits, insects, and the meat of wildlife killed or scavenged. Although coyotes generally prey on small rodents, rabbits, birds, snakes and frogs, they will kill larger animals such as big game and livestock during periods when the larger prey are more vulnerable to predation (e.g., turkey on nests; deer fawns in the spring and summer; lambs, kid goats, and newborn calves). The coyote will not pass up a free meal to feed its belly with artificial food resources. They will scavenge exposed garbage or other refuse, and may even kill and consume house cats. The coyote is legally classified as a nuisance species and may be killed at anytime, except coyotes may not be killed with a gun, firearm, or other weapon on Sunday. The coyote, a medium sized canid predator, occupies an ecological niche that has been void since the extirpation of wolves from Virginia around the beginning of the 20th century. In addition to inflicting mortality on small as well as large prey species such as beaver, turkey and deer, coyotes tend to kill or exclude red fox from their territories in red fox habitat and may subsequently limit red fox population abundance. The coyote may also indirectly benefit ground-nesting bird species, such as Bobwhite quail, by killing or excluding ground-nest predators such as raccoon, opossum and skunks. Coyote populations, not unlike all wildlife populations, will continue to grow until their numbers are limited by food availability or space. Unlike most wildlife populations, the reproductive potential of coyotes is such that harvesting coyotes for recreation or fur pelts or other economic incentive will not generally have any impact on limiting or even reducing the abundance of the coyote population. In general, increasing coyote mortality through hunting and trapping will tend to only change the age distribution of the population rather than change pre-whelping population density. When populations of game species decline, hunters and some game resource managers may sensibly conclude that coyote predation on game is reducing or limiting game populations. Under certain conditions coyote predation has been shown to limit the abundance of big game populations. However, under normal conditions – that is when there is an abundance of game habitat available and the game population has not been decimated by disease or by another catastrophic mortality factor – predation will rarely limit the population abundance of a game species. In fact, it is more often the case that overall prey abundance and diversity will dictate the total number of coyotes that can thrive in a given area. Coyotes are medium sized carnivores that are very territorial in nature, and generally will not tolerate other coyotes or dogs trespassing in their territories. This behavior is even more pronounced when coyotes are caring for their young anytime between March and August. For this reason, coyotes have been known to show aggression and attack or even kill free-roaming small domestic dogs and cats that live within a coyote family’s territory. Attacks have also been known to occur in the yard or on the porch of houses.